Our Mission is to follow Jesus' example through Strength in Academics, Trustworthiness, and Faith in Christian Values. Welcome to our Preschool Family at St. Fabian! Hello! 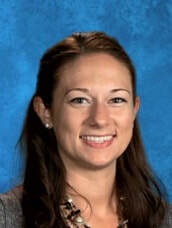 My name is Jaclyn Anderson and I am the preschool teacher here at St. Fabian. I have been a staff member at St. Fabian since 2013 and since then, STF has truly become my second home and family! Throughout my years of teaching, I have taught 1st Grade, Kindergarten, and Preschool. I love spending my day with the children and seeing how beautiful and funny the world is through their eyes! My husband, Kyle, and I live in Brighton with our 2 dogs (Zeke and Otis) and 2 cats (Josie and Sophie). In our free time we like to go out to eat, watch movies, travel, and spend time with family and friends. I come from a very loving Catholic family and, coincidentally, some of you may know my mom, Mrs. Szuba (the Principal)! Through my time teaching at St. Fabian, Mrs. Szuba got to know our wonderful building, families, and students. Then, as fate may have it...she was unexpectedly drawn in just like me! In our preschool, the classroom becomes a home away from home for the children as they learn and grow and we quickly become a family. Together, through consistent communication between home and school we expand social skills, increase positive self-image for the children, and create wonderful memories to build a solid base as they begin their educational career. We offer the opportunity to join in numerous activities through school-wide events and parish gatherings for your whole family! 3 Year Class - - Tuesdays & Thursdays - - 8:15 a.m. - 11:00 a.m.
4 Year Half Day Class - - Mondays, Wednesdays, & Fridays - - 8:15 a.m. - 11:00 a.m.
4 Year Full Day Class - - Mondays, Wednesdays, & Fridays - - 8:15 a.m. - 2:45 p.m.
STF Preschool is the place to be!